Strolling mariachis and artwork by Hispanic artists from Arizona and New Mexico highlight this festive, casual and friendly annual marketplace, the largest of its kind in Arizona. Chat with more than 65 artists as they sell a range of distinctive and unique artwork. 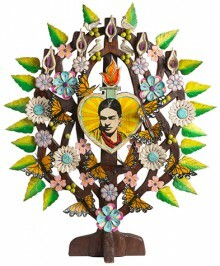 With art in every price range, the 14th annual El Mercado de Las Artes [formerly known as the Spanish Market] offers buyers a wide selection of objects from different Hispanic traditions, including Santos, pottery, embroidery, furniture making, painting, printmaking, and silver and tinwork. The Courtyard Café will offer a menu of festive and traditional foods. The Mercado is free with a suggested donation of $10, which includes museum admission. The museum is open the same hours as the Mercado. This year’s signature artwork is by local Phoenix artists Gennaro and Luciano Garcia, and honors the spirit of Frida Kahlo, the legendary 20th century Mexican artist. While visiting the Mercado, be sure to see the Heard’s exhibits Frida Kahlo – Her Photos and Las Favoritas de Frida: Selections From the Heard Collection. Find an expected El Mercado artist from the list below, then click on the Artists Booth Map to find the artist’s location at the Mercado. 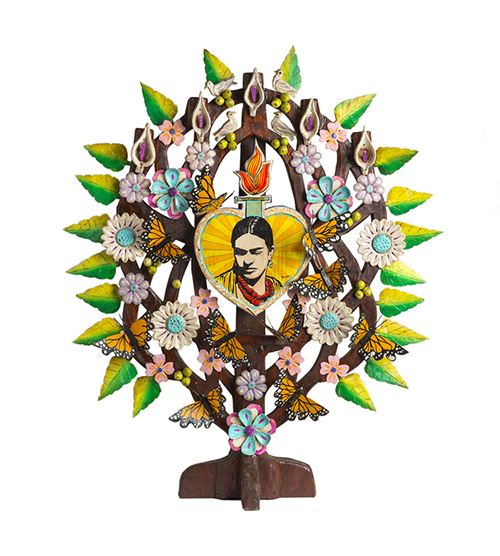 Phoenix artists Gennaro and Luciano Garcia created this tribute to Frida Kahlo for El Mercado de las Artes titled "Frida de mi Corazon."